So here goes a hair product post. I recently bleached my hair back to platinum blonde and it was quite a rough ride. Now I need good products to keep my hair shiny and healthy. Today I have my favorite everyday shampoo and conditioner combo for you. Of course I use a lot of other products along with these but I’ll get to those on some other post. My problem is that my scalp can’t handle silicone at all so that is the first thing I look for when I find new products that touch my scalp. I get itchy bumps and my hair starts to fall off easily of I use products with a lot of silicone for a long time. So I’d decided it’s better to just buy shampoo and rinse off conditioners that don’t have silicone at all. I do use leave in conditioners with silicone though (did I use the word silicone enough?) ;). 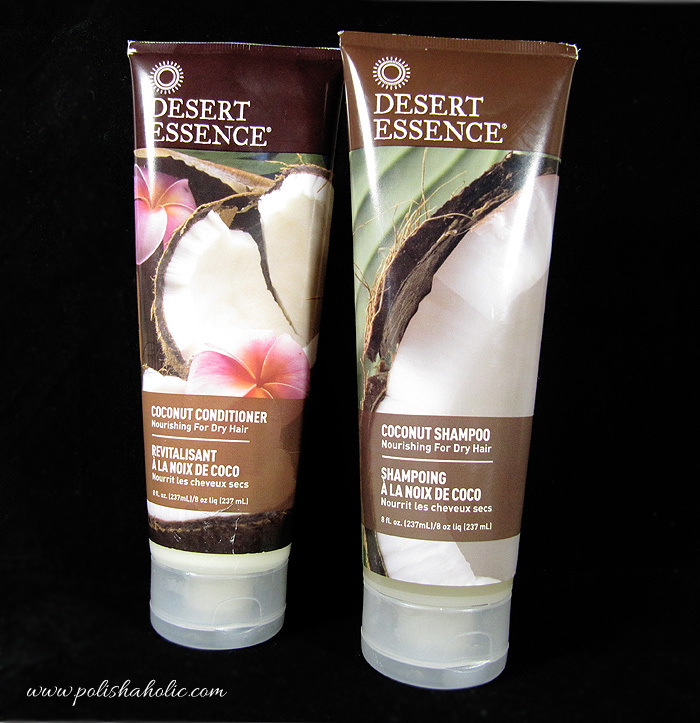 I have found Desert Essence Coconut shampoo and conditioner to be perfect for my bleached hair. I buy these from iHerb. The price is very reasonable and they ship internationally. 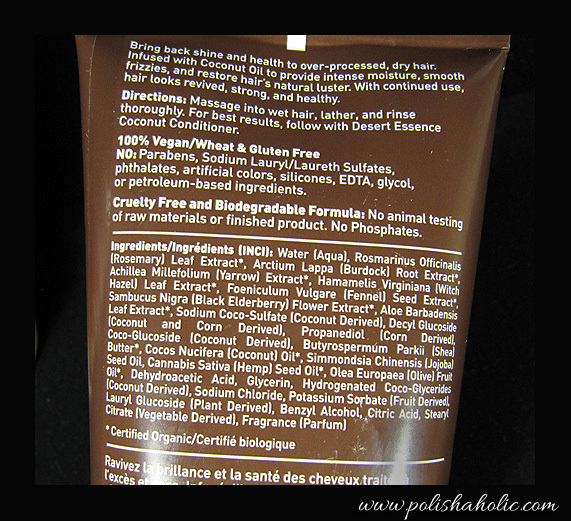 The shampoo lathers really well which isn’t always the case with natural shampoos. It also washes my hair squeaky clean. After the shampoo my hair feels like one big dry mess that will never be untangled but when I add the conditioner I can run my fingers right through it without any problems. 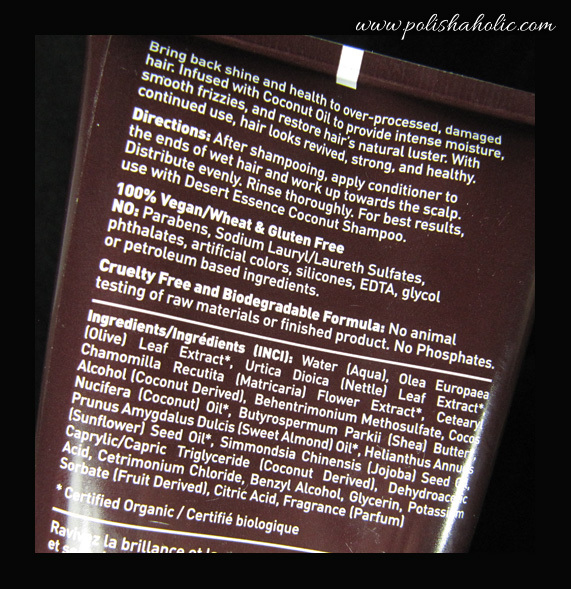 Formula on the shampoo is very gel like and it isn’t runny at all, the conditioner is thick and creamy. I also LOVE coconut scent in almost any cosmetics product so the strong coconut scent is just one big plus for me. These do smell pretty sweet so if you don’t enjoy coconut these might not be for you. I haven’t noticed the scent staying on my hair too long though. Here’s the back of the bottles with the INCI. These really work great for my hair and I use them most of the time at the moment. Along with these I also use moisturizing conditioner along with a keratin conditioner. After the wash I use leave in conditioners. My favorite at the moment is Moroccanoil. What are your go-to hair products and you have any good tips for me? I am 42 year old, mother of three, wife, beauty professional. Makeup enthusiast and lover of gorgeous nails. I am forever a horse girl, dog person and a stubborn red head. This is my place, my home in a world of beauty. 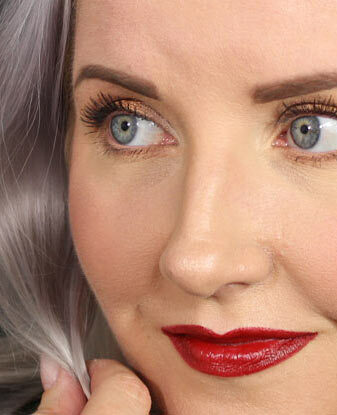 Come join me on my journey of finding beautiful makeup products, gorgeous nail polishes and perfect skin care for aging skin.